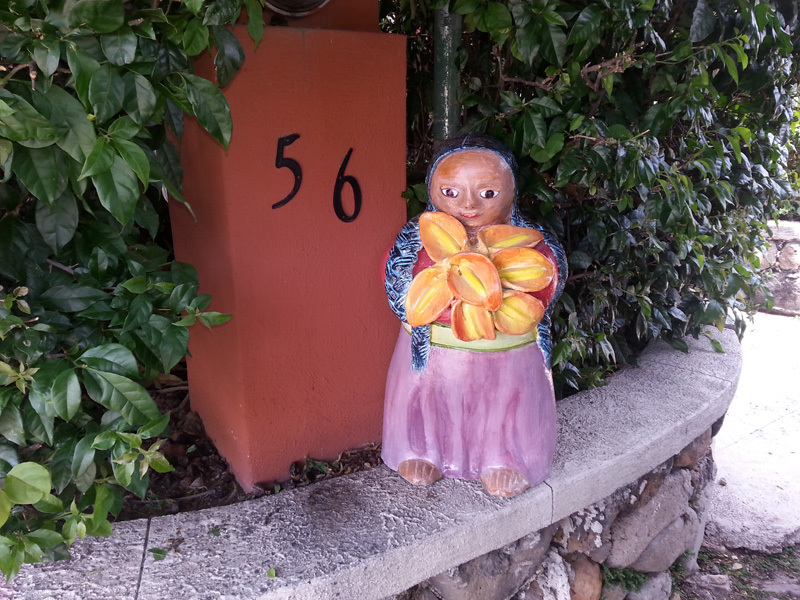 We just renewed our lease at #56 El Parque through April of 2017. It is small villa, but very comfortable for the two of us. Plus it is in a great gated community, safe and secure when we choose to leave on trips to visit the kids or tour places we have not yet seen. 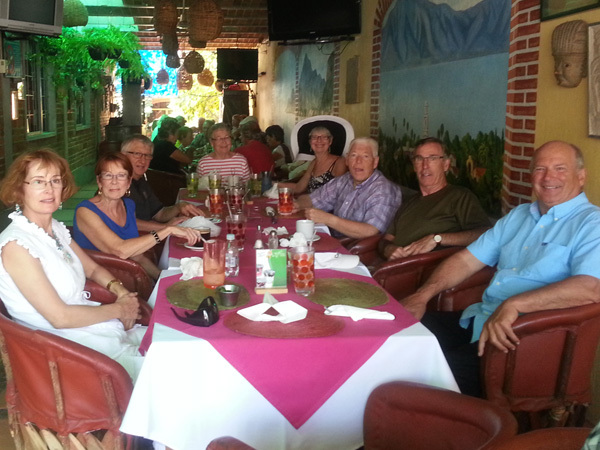 We gathered with friends at Viva Mexico, one of our most favorite restaurant. This is where Larry can get a 12 oz. Fillet Mignon for $7.00 and the best Margaritas in town. 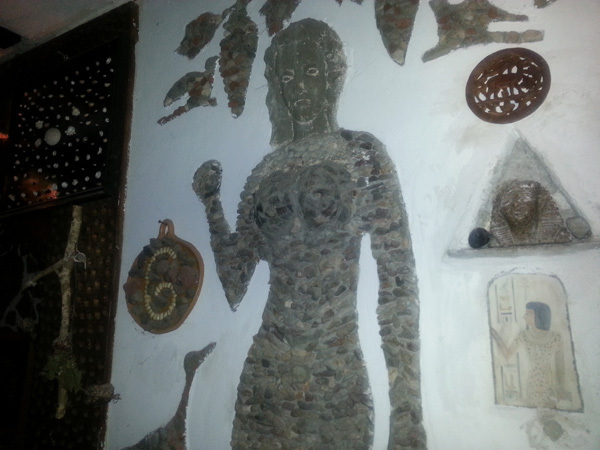 The illusive Salvador's is a bar built and decorated with rocks from the mountains overlooking Jocotepec--sometimes it's open, sometimes it isn't. Always makes for a nice stop. 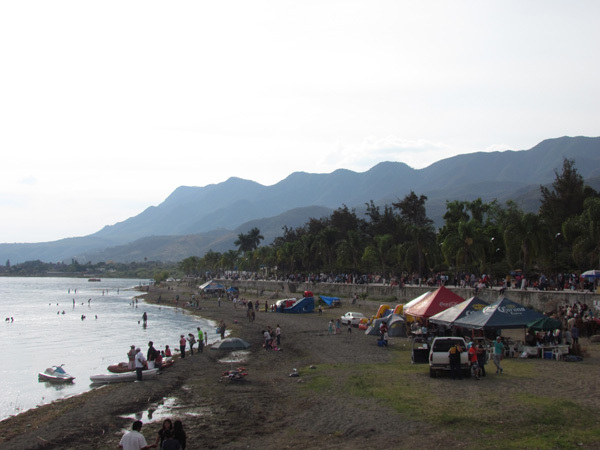 Mexican's love to celebrate and Easter break is a two week affair here along the shores of Lake Chapala. 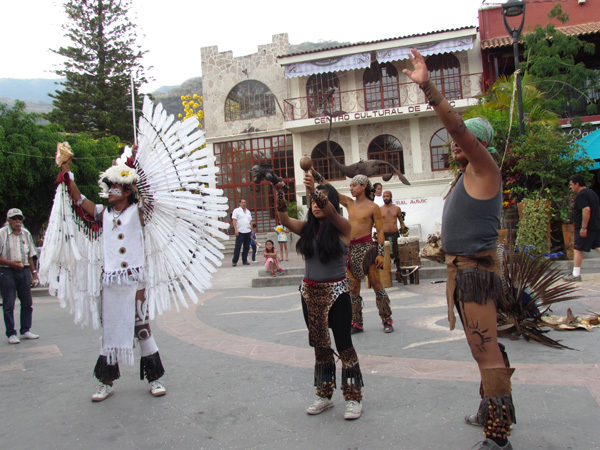 The little village of Ajijic swells to twice its normal size, mostly people from Guadalajara. Following the annual passion play on Good Friday, the plaza next to St. Andrews Catholic Church was filled with people watching these youngsters reenact a traditional Aztec ceremony. Easter Sunday brunch brought out a bunch of friends to dine on a special lamb dish at Tony's Restaurant just down the street from our place. 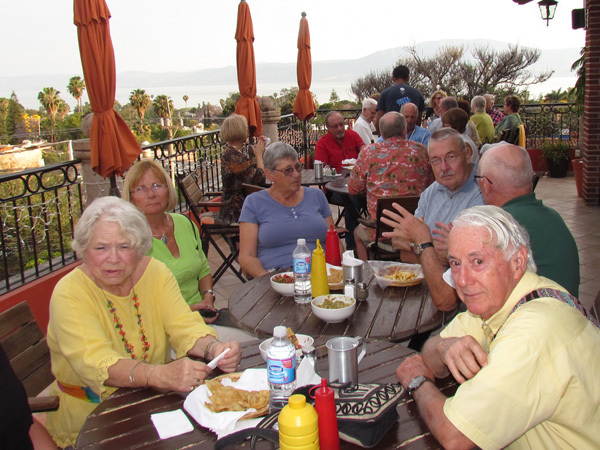 About 30 people met at Lago Bistro and Cafe billed as the "best view of Lake Chapala." 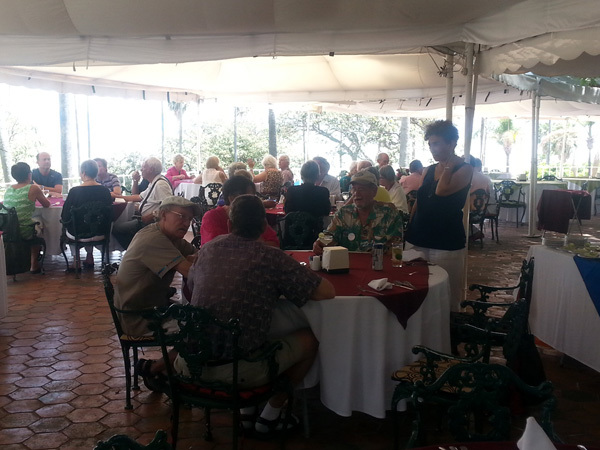 It is a roof top restaurant on the third floor with great views in all directions. 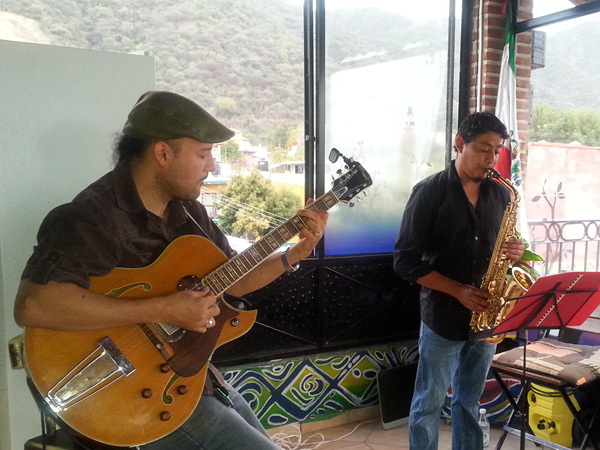 As we dined and enjoyed the views overlooking Ajijic, Blue Velvet Jazz band played background music. Load enough to enjoy, yet quiet enough to meet and greet with snowbirds getting ready for their summers back home. 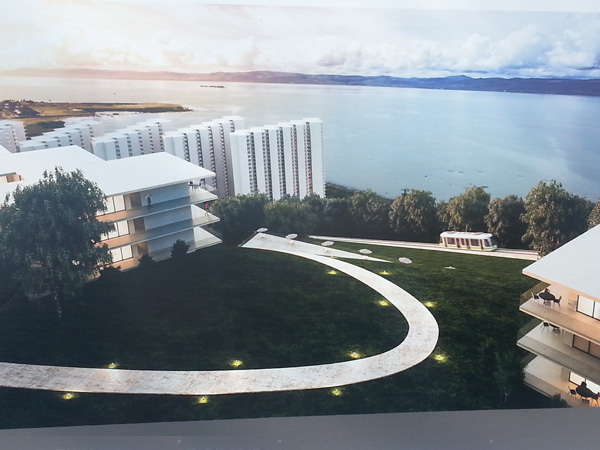 This "rendering" is of a new resort development being proposed for Chapala, with every unit having a view of Lake Chapala. The chances of this ever getting off the ground is somewhere between slim and none and Slim left town. 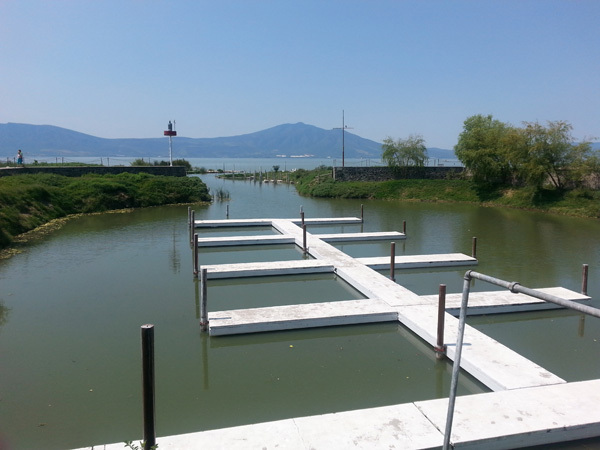 While attending the info-session about the new condos, we found this cool marina on the lake. However, with the lake level being so low, the slips are just setting empty. Friends Mary and Phil hosted another wonderful dinner and wonderful farewell party for snowbirds who are returning home for the summer. While the girls were inside, the boy enjoyed the terrace. This is the first time that we are saying farewell rather than being said farewell to. Feels good to settle down for a bit. Noe, Poco, and Jimmy entertained us during one of our traditional Friday night socials. 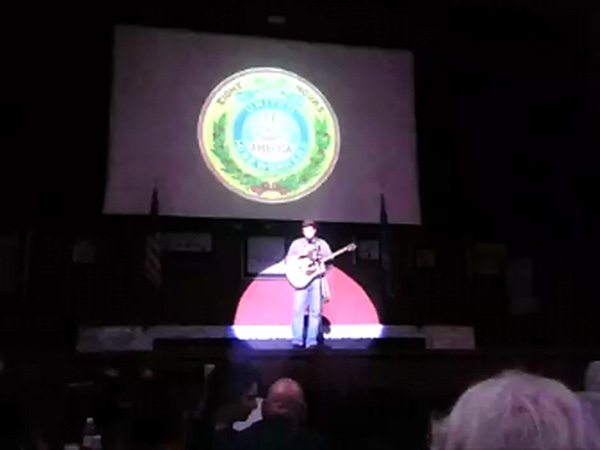 Jimmy, on the far right, is impersonating Louis Armstrong's "It's a wonderful world." This winter, we attended a bunch of Sunday matinees hosted by the Jewish Film Festival or the Democrats Abroad. All the movies were great, with most pulling your heart strings. 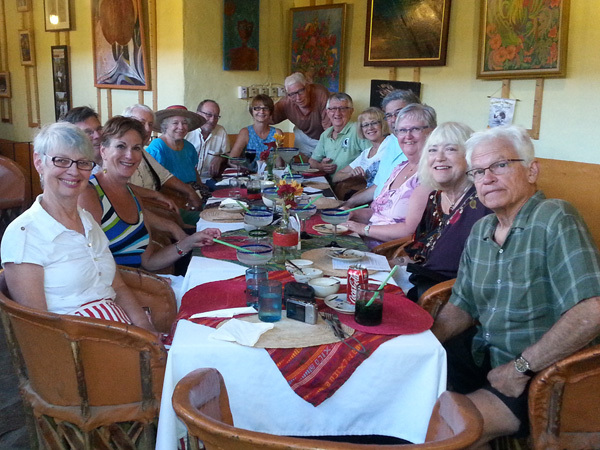 Friend Randy (and husband Andy) hosted a great farewell dinner party. 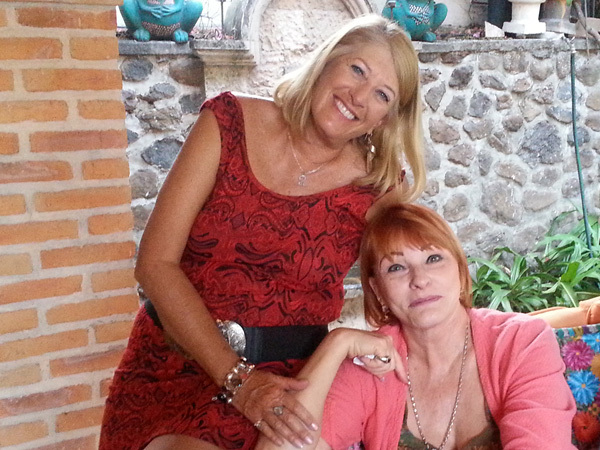 Here she is with her friend whose daughter was the inspiration of the TV series--Medium. 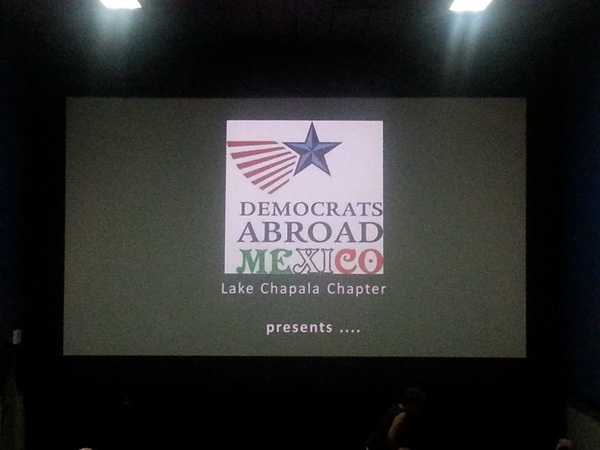 We attended the National Convention of Democrats Abroad--Mexico, which was hosted by the Lake Chapala chapter. 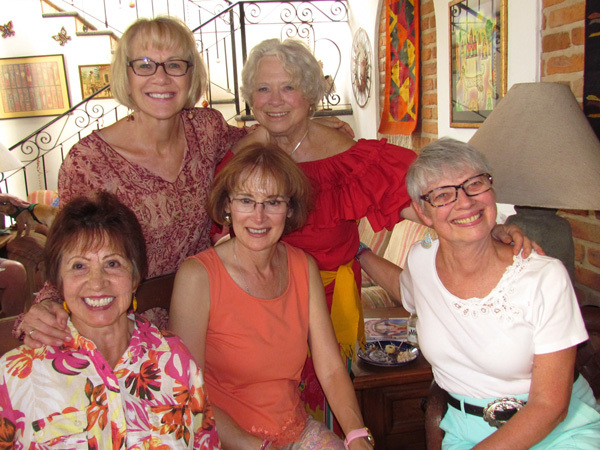 All five chapters from throughout Mexico were in attendance. The restaurant/hotel where it was hosted is quite impressive. 'Hard Travelin' with Woody, was a 40 city tour throughout North America with songs written by Woody Guthrie, depicting stories and songs of the labor movement following the dust bowl era. 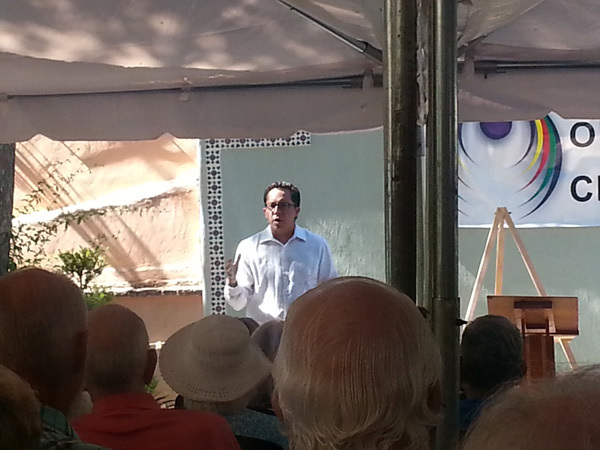 At Open Circle, Dr. Pablo Jaramillo highlighted the plight of the Monarch Butterfly. In less than one decade, only 10 percent of the Monarchs are returning to their winter sanctuary. He faults climate change, herbicides and pesticides. 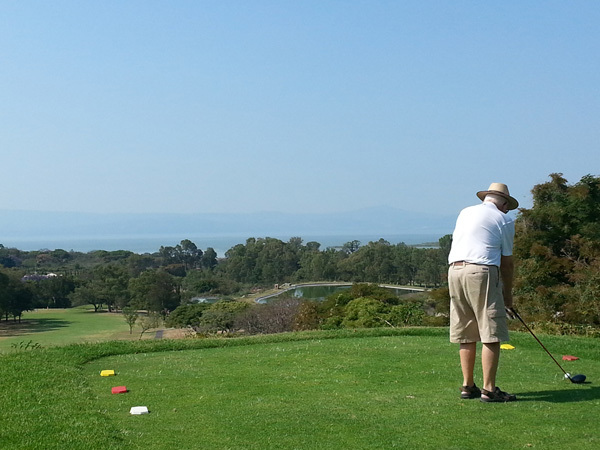 Thanks to Brian, Larry got to play his first 18 holes at Chapala Golf and Country Club. The 12th hole tee box sets high above the fairway which gives great views of ponds and the lake. 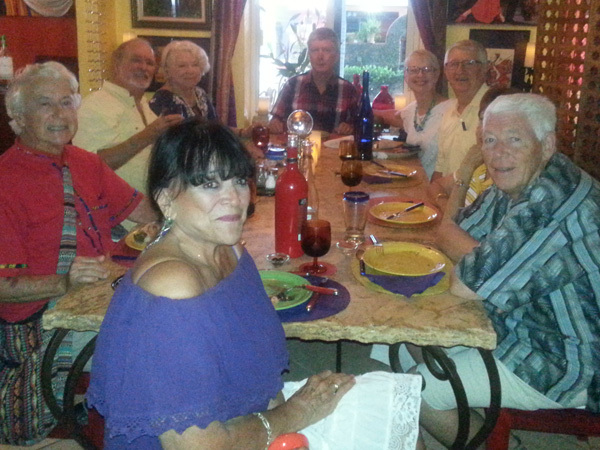 We joined in on another great farewell dinner party hosted by friends Norn and Lil. 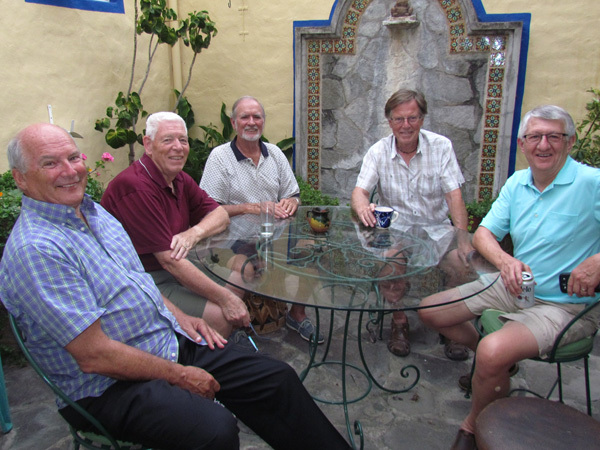 We have heard estimates that 75 percent of the foreigners who live around Ajijic are snowbirds. Larry with his Momma--Rose. His real mom's name was Rose, so thus the name. She enjoys it also and calls Larry her favorite (and only) son. 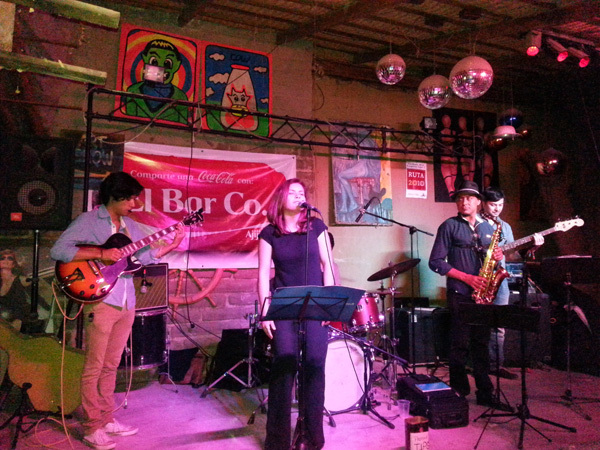 Maria-Claire is a young jazz singer who grew up in France and now lives near Ajijic. 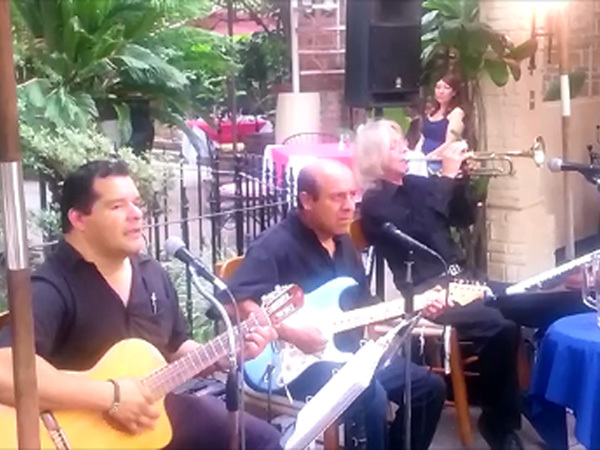 She is joined here at a local pub with a jazz band from Monterrey Mexico. 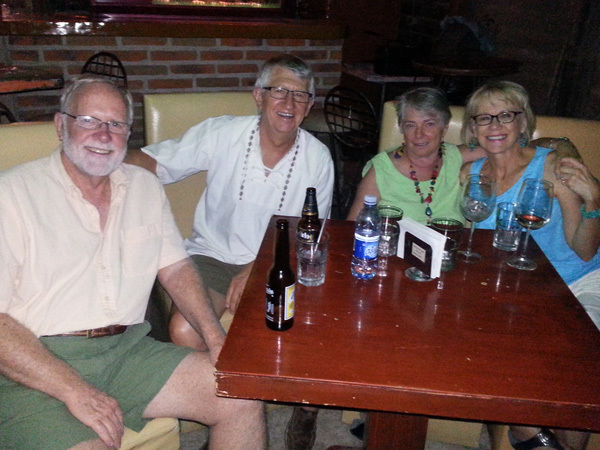 Thanks to friends Ron and Jean, we learned about this jazz band, so we joined them for an evening of cocktails, fine music and lots of laughs. 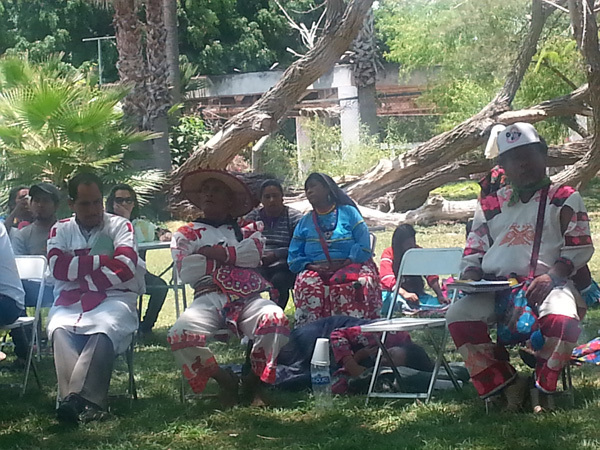 Shaman and spiritual leaders joined academician and scientists from throughout the world for the Multicultural Universal Dialog conference in Guadalajara. The sole purpose of making our planet a home where we can live in harmony in an atmosphere of respect and understanding. 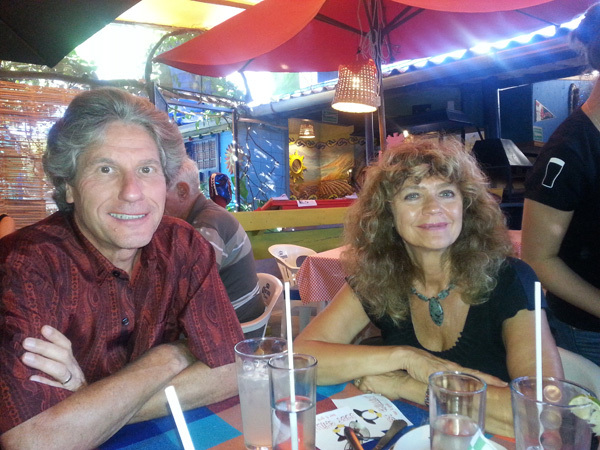 Just chill'n, at the restaurant called Just Chill'n with friends John and Patricia, who we met during our Mexico City tour in December. 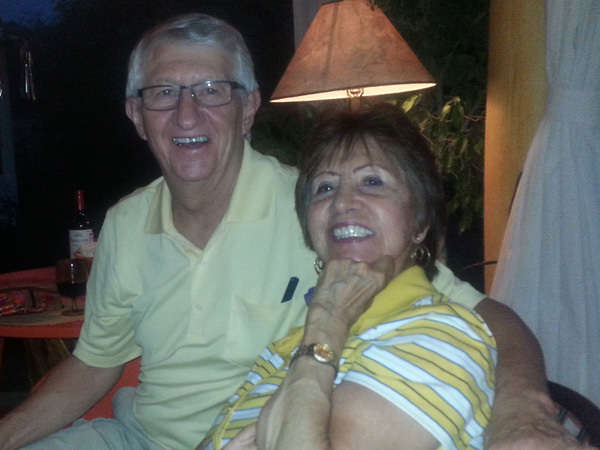 They are formally from Calgary, have retired and are in the final stages of building a new home in North Ajijic. Can't wait to see it.